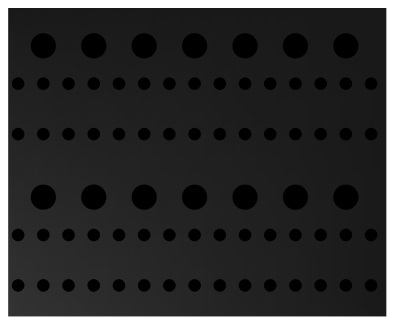 SONAR (SOund Navigation And Ranging). 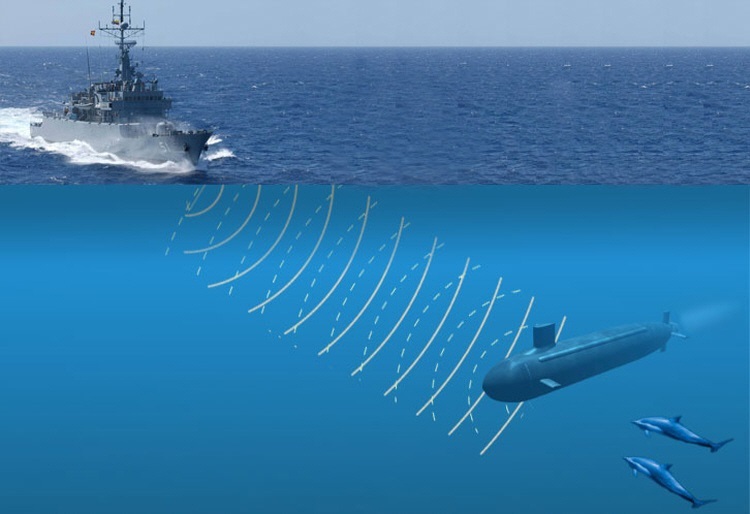 Submarines can be detected acoustically via 2 main mechanisms: active detection (another vessel may emit a ping into the water; the larger and closer the object to be detected, the stronger the return signal or “target strength”) and passive detection (passively listening). Just as the main acoustic detection mechanisms can be divided into passive vs. acoustic, so can the main acoustic stealth/silencing measures (however, only basic passive controls will be discussed here for simplicity). Most passive stealth controls revolve around the use of anechoic (an-echo-ic) materials. These materials are generally elastomeric (think “rubber”) with built-in voids/air cavities and act to absorb, rather than reflect sound. By cutting down on this sound reflection, you can effectively reduce active sound ranging off an anechoically-coated hull (thus decrease the chances of being detected by sonar) and cut down on the terminal acquisition range of active sonar that may be used by torpedoes. This is all great in terms of stealth; however, there are many considerations that may go into the design of these anechoic materials. Unfortunately it is not quite as simple as just slapping rubber tires to the side of your submarine! Elastomers are a class of polymers and thus exhibit viscoelastic characteristics, meaning their properties may be likened to both those of liquids (viscously damping, hence “visco-“) and solids (elastically responding, hence “-elastic”). Which of these effects dominates the material characteristics depends on temperature, encountered frequency (i.e. sound frequency), and many other things. Having considered this, it becomes apparent that the material must be designed properly to express the desired material properties, which can be controlled a number of ways. The principle means of doing this would be by controlling the size and placement of the voids (which may affect material stiffness, density, porosity, relaxation modulus, sound frequency ranges attenuated/blocked, etc.). In addition to this, the variability of these properties must be considered as well. 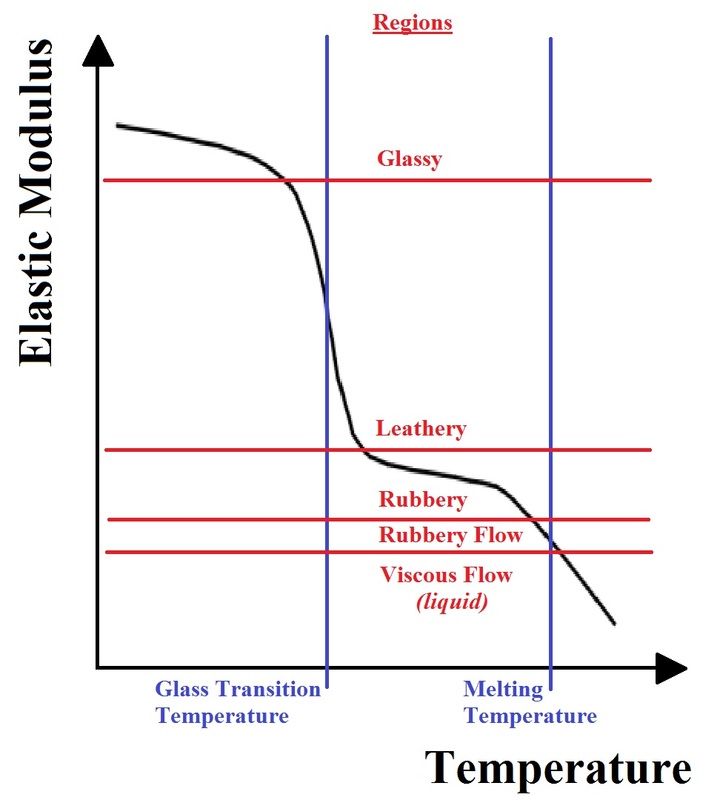 For example, you must be sure that your material properties do not change significantly with changes in operating temperatures or encountered signal frequencies, both of which may create significant changes in properties such as elastic modulus (analogous to stiffness), as shown below. General amorphous polymer temperature dependence. Another means by which the material properties might change is related to the chemical stability of the polymer. Water absorption may lead to polymer degradation, which may lead to acid formation, which may lead to further material degradation and thus change in material structure. These kinds of effects may be controlled through the addition of specific additives to the material. Lastly, one must consider more practical considerations: while you could use anechoic materials to coat the exterior of your submarine as well as to provide vibration/noise absorption around internal machinery, the application of these materials can lead to cost over-runs and major weight penalties. In addition to this, often multi-layer coatings may need to be used to achieve combinations of effects or perhaps to allow sound to pass outwards (such as where sonar pings might emanate from) while still absorbing enemy sonar pings! As you can see anechoic materials are a vastly complex subject and can be used to produce fascinating effects and thus serve as an excellent primer to a proper understanding of the complexity and importance of stealth considerations in submarine design! ← What Happens to Your Heart When You Dive? I’m gone to inform my little brother, that he should also visit this webpage on regular basis to take updated from most recent information. Thank you for your support and we will be sure to continue to produce the most interesting posts that we are able! Thank you from Team UV for your support. I am not aware of any forum that discusses the kind of things we do, but 2 good websites that discuss things similar to this article are: DefenseTech.org (technology in the defense industry; doesn’t generally discuss science/engineering) and Engineering.com/DesignerEdge (discusses technology within many industries, often the defense industry, and generally gives some brief insight into the science). Thank you for the complement and the support! website so i got here to return the choose?.I am trying to find issues to improve my web site!I guess its adequate to make use of a few of your ideas!! Thank you for the read and support! I will look into this, thank you for the heads up. Hi there would you mind letting me know which web host you’re utilizing? I’ve loaded your blog in 3 completely different web browsers and I must say this blog loads a lot faster then most. Can you suggest a good web hosting provider at a reasonable price? Thanks, I appreciate it! You can create a website for free on WordPress; however, we pay $18/yr to not have “WordPress” in the site url. You can pay more for further customization. I enjoy what youve got right here, adore what youre stating and the way you say it. Thank you for the good writeup. It in fact was a amusement account it. We use “Parament” which we found in the WordPress.com (our host) theme market for free. Yes, we are using WordPress and no you do not need very much experience with HTML; if you use WordPress.com (as opposed to WordPress.org, which is more code-based) you technically don’t need to do any HTML work. We do not do HTML coding very often, only when we desire further font customization or to use custom widgets, etc. ; but even then, it is relatively easy to figure out how to any customization through the WordPress forums or simply Google. We use the “Parament” blog theme from WordPress; however, we have altered some of the colors and all images on the website (banner included) were developed by us, unless specifically cited otherwise. Very good blog you have here but I was curious about if you knew of any community forums that cover the same topics discussed here? I’d really love to be a part of community where I can get suggestions from other experienced people that share the same interest. If you have any suggestions, please let me know. Thank you! Some of our favorite engineering blogs can be found at Engineering.com, DefenseTech.org, and ASME.org (all of which have fairly extensive forums associated with them). Another favorite is FYFD, which does not have any forums.